Whole body cryotherapy (WBC) is the therapeutic application of extremely cold dry air, usually between −110°C and −140°C. The key providers of this therapy include professionals involved in physical therapy, wellness, chiropractic, athletic training and holistic medicine. Whole body cryotherapy stimulates the body's natural healing abilities. WBC uses extreme cold to induce responses on three levels: the circulatory system, the energy meridians and the nervous system. The history of whole body cryotherapy began in Japan, developed in Europe and migrated to the U.S. Clinical studies are numerous and focused on treatment of pain and inflammation from sports injuries, fibromyalgia, rheumatoid arthritis, multiple sclerosis and skin conditions like psoriasis and dermatitis. the market, and the choice depends on the design of the chamber, one room or two, the number of persons undergoing treatment at the same time, type of coolant. Two-stage cryogenic chamber consists of one or two antechambers where the temperature is approximately -60°C, and a main chamber in which the temperature is maintained within the range -110°C to -160°C (depending on the coolant). In order to maintain such a sufficiently low temperature, liquid nitrogen is pumped directly into heat exchangers which consist cooling, air preparation and control systems. Compressor, filters and dryer constitute the system of breathing air preparation. By this arrangement it is possible to bring in purified dry air, minimizing the feeling of cold, and ensuring transparency in the chamber. Maintaining the temperature is possible by heat exchangers installed in the antechamber and the chamber proper. The control system consists of a power supply and control cabinet providing the necessary data parameters. Extra security is provided by a glazed door which opens under the pressure of the body and an alarm button. A chamber of this type may be used by 5 people at the same time. Cryochamber with cool retention effect is cooled with a mixture of liquid nitrogen and liquid oxygen in the proportions of atmospheric air. The air is pumped from the external tank and sprayed by specially prepared sprinklers. This design is based on the phenomenon of cold retention in a basin, which reduces the importance of thermal insulation and elimination of the antechamber, reducing the cost of materials. About three to four individuals may stay in this cryochamber at the same time, while there is restricted access to wheelchair users. The cryochamber with cool retention effect may be without or with one or two antechambers. Cryobarrel (cryosauna) is a cabin for one person where the patient is immersed in the cold vapours up to the arms and breaths air from the room with the head located outside the reach of extremely low temperatures. It has a swinging door which opens under the pressure of the body, and contact with the patient is very good. Liquid air, esspecially liquid nitrogen is used to generate the coolant. Advantages of cryobarrel are: low cost of use, good contact with the patient, easy installation and it allows the use of cryostimulation by a person suffering from claustrophobia. Cryochamber with a compressor cooling system uses air as a coolant. The chamber consists of two antechambers with a temperature of -10°C and -60°C, and the chamber proper with a temperature of about -100°C. The chamber is isolated from the ground, so it can be installed easily either indoors or oudoors. Three compressors provides suitable temperatures and the cooling system uses only non-combustible and non-toxic gases. This type of chamber has all the elements necessary for the safe performance of cryostimulation, which are additional emergency exit, visual and audio contact with the operator, computer monitoring. The chamber can be used in group therapy. Despite extremely low temperatres, this treatmant is very safe. The nitrogen being used to cool the single-person cryosauna is the same nitrogen that makes up the air we breathe (actually 78% of it). In order to protect the more temperature sensitive tissues such as hands and feet, patients wear dry socks, slippers, and gloves. In the walk-in chambers, patients also have to wear a face-mask (to protect the nose and prevent the inhalation of cold air), as well as earmuffs or a hat covering the ears. During each session the body releases endorphins, which are hormones that make person feel good and energetic. Depending on the condition of treatment, it is recomended the pacient to take initially take 5 – 10 treatments in close succession (separated by 1-2 days --- e.g. 3x/week) to maximize the results. After that patient can take fewer treatment spaced further apart to maintain and improve on the results (e.g. once every week or two weeks) on its own. There is no evidence that anybody can catch the cold because of this procedure. The immediate cold impact of the cryotherapy treatmant will raise the internal body temperature for a short period of time. The stimulation of the immune system can help decrease the severity and frequency of future colds. Also, it is very convenient to claustrophobic people. The cryosauna door is held by a magnet and never locked. 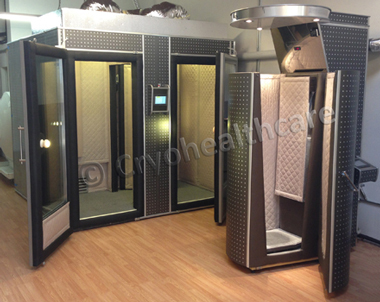 The Cryosauna is open to the top and clients' head is raised above the level of the upper rim of the cabin. The doors of the Walk-in Cryochamber are also never locked and clients may enter and exit at their own discretion. Clients who suffer from claustrophobia report that they feel comfortable in both devices. This procedure is absolutely dry and does not make the skin wet, so there is no need to take a shower before or after the treatment. Physical therapists in rehabilitation centers around the World are leading the introduction of whole body cryotherapy to the population especially of its holistic and non-invasive admission. Clinical studies have proved immediate benefits to soft tissue, internal organs, the nervous system and energy meridians. With so many positive effects to the body, extreme cold therapy has no equal for a patient's wellness plan. Inflammation of Tendons, Bursa, Joint Capsules. effects of drugs, especially antipsychotics and alcohol. Some relative contraindications also exist concerning participation in the cryogenic treatment. These includee age above 65, venous thrombosis and a history of peripheral arterial embolism, excessive emotional lability, expressed inter alia, in excessive excitability. Whole body cryotherapy has been developed in Europe and Japan for more than thirty years ago. Multiple research studies have been published in medical journals about the effects of whole body cryotherapy, and in many European countries the treatments are covered by medical insurance policies. In the United States, whole body cryotherapy is considered a non-medical wellness modality, and health insurances do not offer reimbursements for the service.